Made from superior grade raw materials, our stampings for DC machines are manufactured to provide durable and effective utilization. We offer these DC machines stampings in various specifications of diameters and length to meet varied industrial applications. These DC machines stampings can be customized as per the requirements of our clients. We manufacture and export high quality EMTG plate bottom & top and automotive stampings which is widely used in various industrial applications. We offer our client an excellent quality range of Automotive Metal Stamping, which are manufactured from high grade quality raw materials. These Automotive Metal Stamping can be customized as per our precious customers specifications. 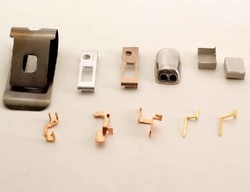 These Automotive Metal Stamping are widely known for its durability and quality. We bring forth to our clients high quality 1/2 HP Stack for Mono Block Pumps, which is known for its precision engineered design. 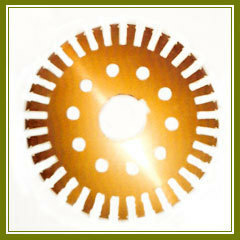 This is extensively used in varied industries like Agricultural and other industrial applications. Known for features like reliable performance, high efficiency and longer service life, this is demanded by our clients. This series of Automotive Link Stamping has been fabricated with the intention to bring together all the positive experiences and ideas available and bundle them up in and innovative yet reliable package. These Automotive Link Stamping are widely available in various dimensions and specifications. Swastik Enterprise is one of the leading manufacturer, supplier and exporter of machinery spares for Circular looms and cheese winder for PP/PE Woven Sack industries since last 15 years. A vast range of products including body parts, chassis parts, reinforcements, brackets, frame add-on parts, and other general stampings are manufactured by Caparo engineering india pvt ltd (CEIPL). The product range spans from 0.5 mm to 4 mm, from as small as a few centimeters to as large as 2.5 meter x 2.0 meters.